The project involved a cast metal, integrated studies and intergenerational residency, a community metal pour event and the permanent installation of a collaborative public sculpture. The mixed core group of adult ELL and 6th grade learners at Phalen Lake Elementary School in St. Paul, a Hmong Studies and Core Knowledge Magnet, learned the cast metal sculpture process and were docents that facilitated a sculpture workshop at the community metal pour event at their school. Family, friends and community members had the opportunity to teach, learn from and create with each other – and together watch as metal was poured into their molds. 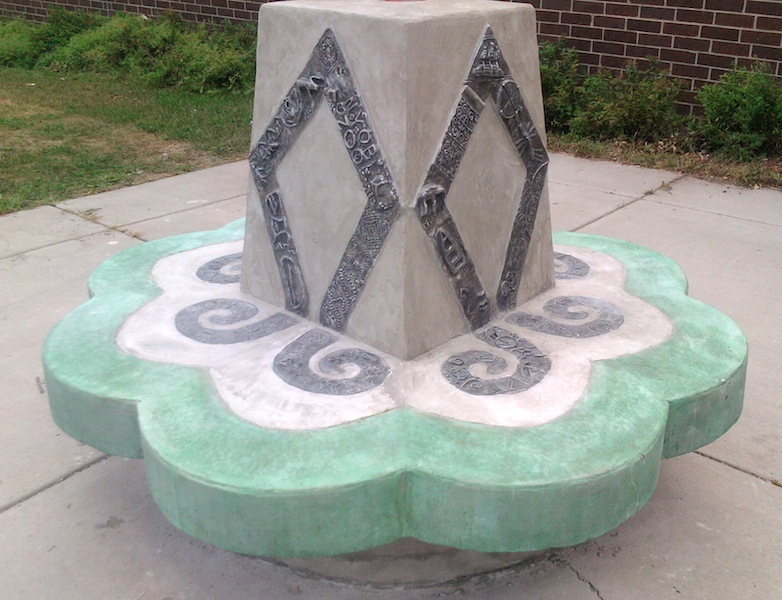 The learners artwork is a reflection on personal symbols and are united together in the shape of the school’s logo, the Hmong Elephant Foot symbol. The Elephant Foot symbolizes the family unit, the foundation of all life, and strength. The cast metal artwork is inspired from personal and cultural symbols, motifs and the paj ntaub (“flower cloth”). Symbols have a long history as a form of communication for the Hmong, since their original written language was lost. The designs and shapes in their textile art are symbols for characters that were once written. Stories, folktales and events were recorded onto fabric because cotton was readily available and the most permanent. Their imagery has deep meaning – triangular shapes represent the mountains that kept them safe and people crossing the Mekong River to escape the Viet-Cong. Textiles were and still are a way of documenting and preserving Hmong culture and life. This project was made possible from a Community Art Program grant from COMPAS, St. Paul, MN and in-kind donations. Thank you: 6th Grade Art Class, Adult ELL Learners, Community Members/Creators, Mark Chookiatsirichai/Co-Creator, Gail Dahlberg/Concrete Installation, Jayne Meyer/Art Teacher, Bella Hanson/Adult ELL Teacher, Ben Bryant – Adult ELL Volunteer, May Lee Xiong/Hmong Culture and Video Production, Mary Sellers/Home School Liaison, Shawn Wright/6th Grade Teacher, Catherine Rich/Principal, Valeria Silva/St. Paul Public Schools Superintendent, 5th and 6th Graders/Video Recording.